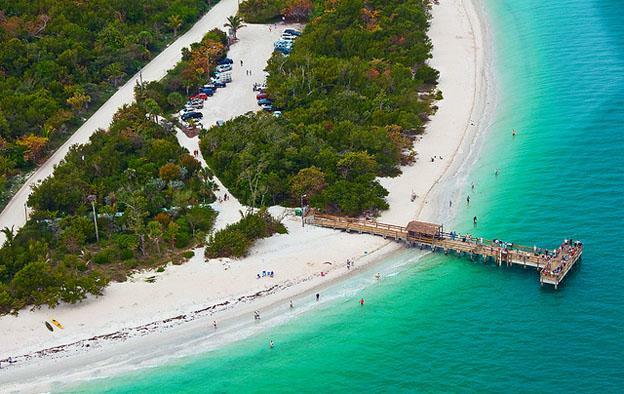 Sanibel and Captiva islands are located on the Southwest Florida gulf coast. The nearest cities to Sanibel are Fort Meyers and Cape Coral. Flights land at the South West Florida International Airport (RSW). Once arrived, be prepared for an experience of laid back island time. Almost one third of Sanibel is devoted to the J.N. (Ding Dong) Darling National Wildlife Refuge so wildlife and the environment are important priorities for islanders. In order to get oriented, visit the Chamber of Commerce Visitors Center, located at the second right after crossing the mainland causeway. Maps and all varieties of brochures can be obtained Monday through Saturday from 9:00 am to 7 pm. phone: 230-472-1080. 1. Experience the three R’s of Sanibel- RELAX, RELAX, RELAX. Honestly, the top choice for fun on a Sanibel vacation is to let the warm ocean and sunny skies remove tension from just about anyone. For however long the vacation lasts, think laid back. There is no need to really do much of anything to have fun. A good book or Kindle, a comfortable chair, and a bit of refreshment are some of the best ways to get into island living. 2. THE SANIBEL STOOP or LOOK AT ALL THOSE AMAZING SHELLS ON THE BEACH! Eventually even the most laid back tourist cannot ignore the shells underfoot in this heaven for shelling enthusiasts. It is quite simply, the best shelling area in all of Florida. If the spirit moves the enthusiast, a handy laminated shell guide may be obtained at most stores or the Chamber of Commerce. Don a pair of good sand shoes (not sandals), carry a bag for the loot, and crunch along the shell strewn sand, picking up whatever looks good. Just be sure that there are no live shells picked up. That’s against the law. Every hotel will have some kind of shell cleaning station to help clean and dry off the treasures. After about three days of shelling, the famed Sanibel Stoop, a somewhat bent back while scanning the beach for shells may appear. Not to worry, this will fade when the vacation is over. Try to be somewhat selective in the shell department since all these shells will have to be transported and displayed somewhere at home. The Refuge is 5,014 acres of land established in 1945 and sometimes known as the Sanctuary. It was named after one of the early leaders of the conservation movement. The best way to see the Refuge is to bicycle slowly through it, packing the camera and binoculars. 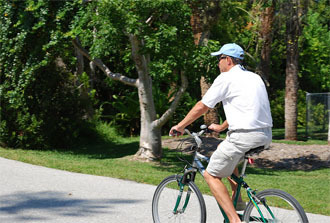 Biking is a favorite pleasure of islanders and bikes are easy to rent. Move quietly and slowly and aim for low tide for best wildlife viewing. Seeing a roseate spoonbill flying at sunset is a spectacular experience. With over 291 species of birds, about 50 kinds of reptiles and amphibians, and at least 32 types of mammals, some kind of close encounter with nature is bound to happen. Guided tram tours are also available from Tarpon Bay Explorers. The island is nice and flat and ideal for easy biking. Maps with bike routes are available from the Chamber. Take a trip to the east end to visit the Sanibel Lighthouse. Take a photo of this well loved landmark and perhaps even try some fishing from the pier. Although there is an hourly fee for parking at this beach and its a bit of a walk to get to the beach, it is a wonderful place. 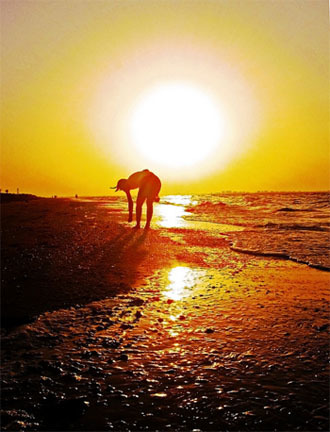 The shelling is fantastic and it hosts spectacular sunsets, restrooms, and picnic tables. The museum village is a bit like a beachy Williamsburg. It is full of historically interesting and enjoyable hands-on exhibits with great guides. It is worth the trip beyond the beach since all ages will enjoy it. Sanibel has some interesting and delicious dining options. Splurge one night or several on some tasty island fare and enjoy the ambiance! TJ the author of the “What to do on a Sanibel island vacation” is the managing editor for Ocean’s Reach Condominums resort, which offers Sanibel island condos directly on the beach. One and two bedroom condos, luxuriously appointed with all of the amenities integrated for a fabulous Florida holiday.